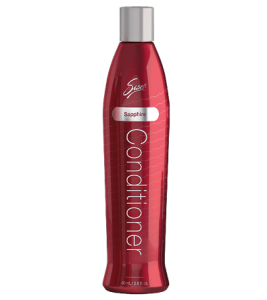 Sisel Sapphire Conditioner features the latest in conditioning technology by utilizing super-fruit blends, antioxidants, and 100% pure Argan oil for long, colored or damaged hair. Sisel Sapphire Conditioner is a creamy, lush conditioner enriched with 100% pure Argan oil. This oil is rich in vitamin E and completely strengthens your hair follicles, root to tip, and provides intense moisturizing properties. It is essential for protecting and restoring dry and damaged hair, for treating split ends, and helps prevent premature graying. Free from sulfates, parabens, and other potentially harmful ingredients, Sisel Sapphire is the safe way to revitalize and restore volume and a luxurious feel to your hair. Super-fruit blends, antioxidants, and 100% pure Argan oil for long, colored or damaged hair.